Graphite Design, established in Japan in 1989 and in the U.S. in 1997, is the industry leader in shaft technology and the preferred shaft brand for golf professionals worldwide. One of the world’s three largest golf-club shaft manufacturers, the company made its mark manufacturing premium shafts for most of golf’s major OEMs, including the top four companies by sales volume. Graphite Design shafts continue to be preferred by top club makers the world over while the company’s mainstay Japan series; Tour AD DI, DJ, BB, GT and MT shafts, and US Series; G-Series, YS+ and G-Tech shafts are extremely popular among avid and occasional golfers. Revolutionary technology, design and sourcing the most advanced materials are trademarks in all Graphite Design shafts, making them the highest quality performance shafts on the market. Validating the company's Tour AD logo, all of Graphite Design's PGA Tour-proven golf shafts specifically promote "Accuracy and Distance" and these key competitive advantages are helping professional and amateur golfers optimize their games after switching to Graphite Design shafts. Graphite Design shafts have been the number one shaft played on the Japan Golf Tour for ten years running. New for 2014, Graphite Design introduces the newest addition to the Tour AD premium line of golf shafts, the Tour AD MT. Designed and manufactured at the Graphite Design Japan factory headquarters, the new Tour AD MT wood shaft is available in 50g R2, R1 and S flex, 60g SR, S and X flex, 70g S and X flex and 80g S and X flex. The Tour AD MT design is based on the very popular Tour AD DI model and utilizes the same Toray Company’s Nanomaterial or “DI Technology” in the tip section of the shaft. The Tour AD MT features a stiffer mid-section and slightly softer tip than the Tour AD DI. This design feature will produce optimal launch and spin characteristics in today’s low spin drivers. The new Tour AD MT provides a player with Maximum energy Transfer resulting in superior Accuracy and Distance. Revolutionary technology, design, and the most advanced materials are trademarks in all Graphite Design shafts, making them the highest quality premium golf shafts on the market today. Validating the company’s “Tour AD” logo, all of Graphite Design’s PGA Tour-proven shafts specifically promote “Accuracy and Distance”. These key competitive advantages are helping professional and amateur golfers optimize their games after switching to Graphite Design shafts. Graphite Design continues to be the most dominant shaft on the JGTO Tour and has been for the past eleven years. The G Series Iron shaft with X Directional Technology (XDT) is the next generation of premium Graphite Design shafts and is designed to be very adaptable to today’s vast iron head technology. The G Series Iron shafts performance characteristics favor a mid launch trajectory and low/mid ball spin and are available in a unitized .370” tip OD shaft configuration. The weights available are 73 grams in Athletic, Regular and Stiff flexes, 83 grams in Regular, Stiff and X-Stiff flexes and 93 grams in Regular, Stiff and X-Stiff flexes. X Directional Technology (XDT) incorporates the use of the already proven Graphite Design MSI (Material Stiffness Integration) design method as well as this new and unique application of graphite fiber ply angle alignment throughout the shaft structure. During the development phase of XDT, measurable performance gains were discovered through a more balanced distribution of the graphite fiber angles within the piles of the shaft design. This proprietary application of XDT has made the new G-Series the most balanced, versatile high performance golf shaft available today. G-Series Red: The G Series shaft with X Directional Technology (XDT) is the next generation of premium Graphite Design shafts and is designed to be very adaptable to today’s new head technology. Available in six weight categories, the G-Series wood shafts offer a wide range of shaft weights and launch angle characteristics to golfers of all skill levels. The G Series lighter weight 40g and 50g series offer a mid/high launch angle, the mid weight 60g and 70g series produce a piercing mid launch trajectory and the heavier 80g and 90g series favors a low/mid ball flight. G-Series Hybrid: The G Series hybrid shaft with X Directional Technology (XDT) is the next generation of premium Graphite Design shafts and is designed to be very adaptable to today’s vast hybrid head technology. The G Series hybrid shaft performance characteristics favor a mid-high launch trajectory and mid ball spin and are available in 85 grams in Regular, Stiff and X-Stiff flexes and 95 grams in Stiff and X-Stiff flexes. New for 2014, The G Series Silver shaft with X Directional Technology (XDT) is the 2nd generation of the G-Series wood shaft line. Available in two weight categories of 60 grams in Regular, Stiff and X-Stiff flexes and 70 grams in Stiff and X-Stiff flexes, the new G-Series Silver wood shafts were designed with a stiffer tip section and will offer lower launch and lower ball spin characteristics than the G-Series Red models. 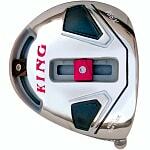 This is a great driver head. I have build more than a dozen drivers and this one has the highest quality I have seen yet.